500. Which year showed the best result in MBA entrance exams (in terms of percentage of students who cleared) ? 501. What was the percentage of students who succeeded in at least one of three exams in 2000 ? 502. What is the percentage increase in the number of students in 2002 over 2000 ? 503. 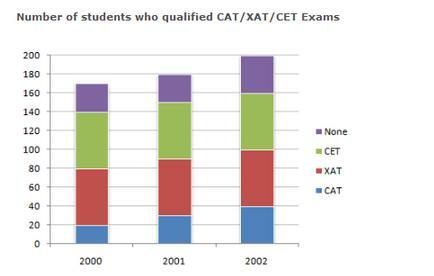 What is the percentage of students who cleared CAT in 2000 ?